Conveniently located off I-40 with a million dollar view of the Smokies. We offer boat parking and hook ups with easy access to Douglas and Cherokee Lake. Ten miles from Exit 407,Gateway to the Great Smoky National Park and Smokies Baseball Stadium. 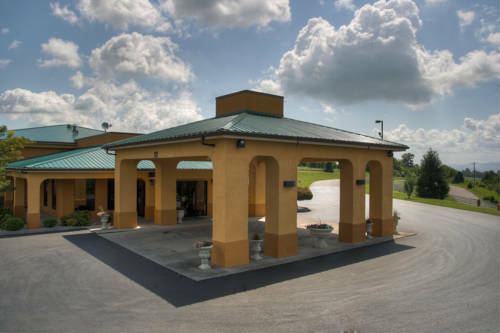 Hotel features include large rooms, microwave, refrigerator and coffee makers with drive-up parking. Daily Hot Breakfast featuring eggs, biscuits and gravy, hot fresh Waffles and assorted breads. We offer Pet friendly rooms upon request. Pet accommodation 10.00 per night/pet. Non-refundable. Weight restrictions apply. Operated by Dukes actor Ben Jones (Cooter) and features the original General Lee car from the TV series. A hard-to-miss burnt-orange marker for the Women's Basketball Hall of Fame.